The MAP Asia staff packed their bags on July 11th, 2016 and took a visit to Nai Nang Village, Krabi province, Thailand with high hopes for a promising partnership. In 2015 the Marriott Hotel in Thailand teamed up with MAP to undertake a mangrove restoration site assessment in Phang Nga province to ensure successful mangrove planting by Phuket Marriott staff as part of their mangrove Corporate Social Responsibility (CSR) program through IUCN Thailand. IUCN had invited MAP to visit the Hin Laad mangrove restoration site to ensure the site was effective in regeneration. 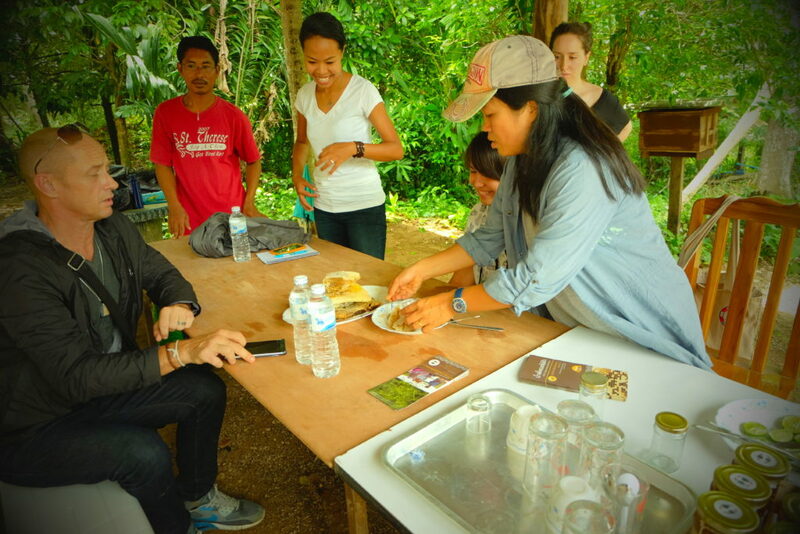 Since then, the Marriott has raised interest in MAP’s work with the Nai Nang Apiculture group selling honey as an alternative livelihood while protecting and restoring mangroves in their village. The meeting was held in close proximity to the bee boxes that the Nai Nang Villagers have built with the support of wood working tools provided by the Mangrove Action Project. The project was funded under Global Nature Fund of Germany and was called “Mangrove Restoration and Reforestation in Asia, a Project for Knowledge Exchange and Action to Protect Climate change, Forest and Biodiversity” as an effort to expand on the few families experimenting with bee keeping in the community. MAP saw the expansion as a gateway to alternative livelihoods for the Nai Nang Village community members. Here is the catch, when villages agree to produce honey, they are no longer allowed to use pesticides on their crops. This is a win-win for all members. The bees can flourish without toxins and chemicals present while the villagers expel the added cost of poisonous products. Some members note a decrease in the number of pests found on their crops and they credit the busy bees! Apiculture workshops and value-add honey product training seminars were held for the people to produce hand soap, shampoo and conditioner to build capacity and market village produced products. 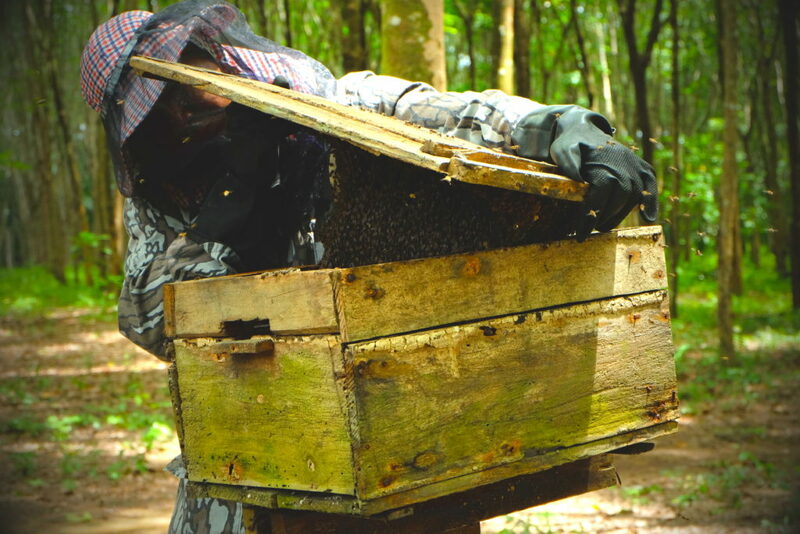 The hives were incredibly successful, and the community sold 276 bottles of honey in 2015! A village Conservation Fund was established with 10% of all honey and honey product sales. This golden honey is produced as part of the mangrove conservation efforts, it was sure to spark the interest of responsible fair-trade businesses. That’s where Mr. Sean Panton, Corporate Social Responsibility (CSR) Representative for the Marriott Hotel chain Thailand and Ms. Kanokwan Homchaaim (Nok), Marriot Thailand’s Field Coordinator for IUCN come into the picture. The meeting was planned to establish a partnership between the Nai Nang Village Apiculture Group and the Marriott Hotel CSR program. Sean and Nok recognized the many benefits of conservation group’s honey, and they are sure the customers of the Marriott would agree. The idea is to showcase the honey on the hotel’s breakfast buffets with background information about where it is produced and with details about the Nai Nang Apiculture Group. This marketing strategy will appeal to conscience of people who are looking to support local communities and local conservation efforts. 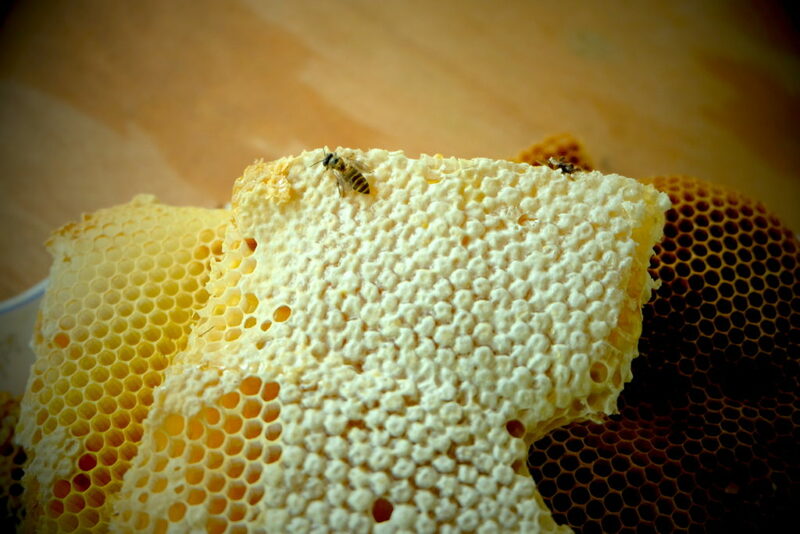 We were lucky enough to visit the beehives and see first-hand the honeycomb extraction. The workers looked more like soldiers; dressed head to toe in a camouflage suit and toped with a veil hat. They were well prepared for the vast number of protective bees working on the hive. We were even given a taste of the fresh honey combs direct from the hive. I admit, I have an inexhaustible sweet tooth and am no stranger to toast and honey, but this honey was a real treat. I haven’t tasted anything quite like it! It was fruity and flowerily all at once. Needless to say, I showed my support and bought a bottle. I am fortunate to have witnessed a partnership that secures the future for this hard working community. Nai Nang Honey should be shared with more people, and they have already begun to do so. 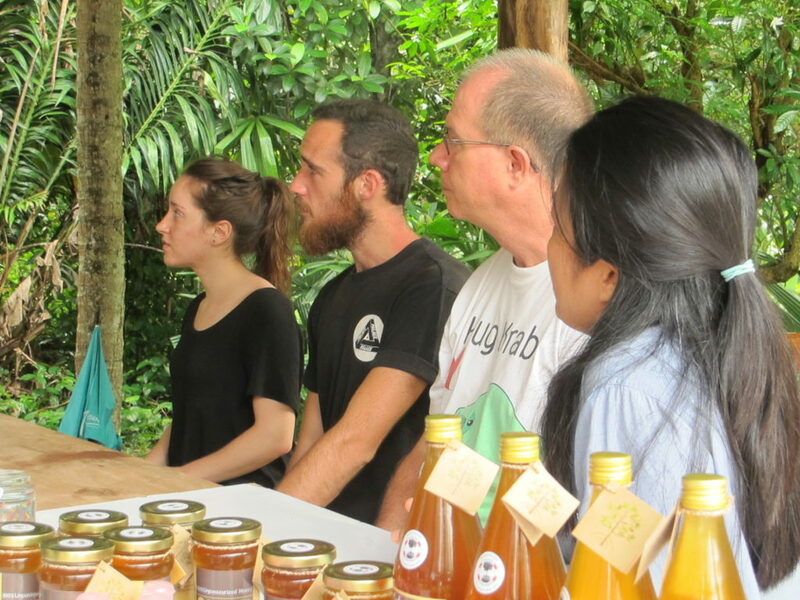 In March 2016 the experienced members of Ban Nai Nang offered guidance in an apiculture workshop for Ban Ta-Sanook in Phang Nga province. This opens doors of opportunity for many families and continued mangrove conservation. Marriott Hotel has made a conscientious decision in supporting conservation related supplementary livelihoods while sharing the benefits of this golden treat.